It was a vision from an American President that brought together a country, to write a new chapter in its history. 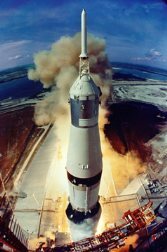 The Apollo 11 mission represented the highest motives and capabilities of the human mind. At 1.5 feet/second (.5 m/s) Apollo 11 eases by tower- mounted camera 363 feet above the ground.